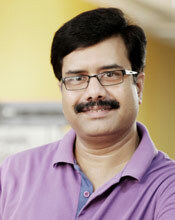 Suryanarayanan, or "Suri", as he is better known, is our Senior Technical Manager. He has been with Real Image right from its inception. Suri's responsibilities include DTS, AudioVision, Pro Tools and a section of research and development in audio technology. He is also the chief technical consultant for DTS audio post-production facilities in India and has attended a DTS technical training program in the USA. He is also into studio design, erection of equipment and turnkey projects. Suri, whose interest in electronics began in school when he was given a book on electronics and radio as a prize for physics, has also done courses in colour television, VCR and video camera engineering, as well as computer hardware engineering. After majoring in sound engineering at the Film Institute, Chennai, Suri joined Media Artists in 1989 as a sound engineer. 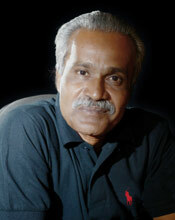 In 1993 he received a national award for best sound engineering for the film "Mahanadi". Since then he has worked on several film songs, albums (including foreign albums) and final mixes. He continues with technical engineering at Media Artists to date. Geeta has worked with the DTS format from the very first Indian DTS movie 'Karuppu Roja'. Her passion for sound brought her to this field in 1988 after completing a Diploma in Sound Engineering. After a stint with Sanketh Electronics, Bangalore and Prasad Recording Studios, Bangalore, she joined Media Artists in 1993. Geeta is the country’s first female sound engineer. She has worked on four National Award winning projects. Apart from movies and pop albums, she has also worked on the sound of several music concerts. They range from Shashank's classical flute concert to the fusion music of Pandit Ravi Shankar and George Harrison. She has mixed more than 35 DTS films which include Tamil, Telugu, Kannada, Hindi, English and two Sri Lankan films. The directorial debut of actress Revathy, Mitr - My Friend, was also mixed at Media Artists by Geeta M Gurappa. Her latest films are Payyaa, Mankatha, Arohanam, Vettai and Vanam. 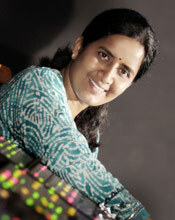 Geeta is the first Dolby Atmos mix engineer in India, having worked on AVM Productions’ Sivaji 3D starring Rajnikanth. Nerve Centre, Traffic Controller, Ring Master. Michael, our Studio Manager, is all these and much more. He controls and manages the studio traffic and handles queries. For a person who had "absolutely no knowledge about the industry" when he joined Media Artists in 1991, Michael has come a long way. He has an excellent rapport with the producers and directors and is always reachable for any query and assistance. Sound moves this Sound Engineer. His career started at Sujatha Sound Studio, Chennai, in 1987. From there he moved to the Armed Forces Film and Photo Division, New Delhi. After a stint at Television Bazaar TV as a Spot Recordist, his passion for sound found a home at Media Artists, where he has stayed since 1995. Apart from working on effects for many films, he was also the man who recorded Abhishek Bachchan's voice for Tera Jadoo Chal Gaya in a hotel room in Kulu Manali. His ambition - to win an award! Mony's experience in editing both audio and video has helped enhance his effectiveness as a sound engineer at Media Artists. He has a Diploma in Audio Electronics from National Institute of Technology, Chennai and Diploma in Photography from The Tamil Nadu Advanced Technical Training Institute. He came to Media Artists from Teletape where he was a Sound Engineer and a Video Editor. To unwind after a busy schedule, Mony heads for the football field.